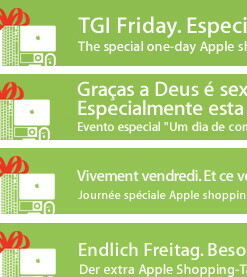 Black Friday is definitely a US phenomenon, where many retailers slash prices for the day after Thanksgiving each year, but Apple has decided to spread a little joy internationally, too. If you shop online at the Apple Store this coming Friday, 27th November, you’ll be pleased to know that many of Apple’s online stores will be offering 24 hour discounts on a range of its products. Stores include the UK and Ireland, France, Germany, Italy, Spain, Denmark, Norway, Australia, and more. Visit your local Apple store online to see whether there are bargains to be had. It’s worth remembering that Apple’s own prices are rarely the cheapest to be had online, particularly on third party products, so it’s still worth shopping around other online retailers. Nevertheless, some hardware and software is seeing significant discounts, so take a look this Friday. You might not do Thanksgiving where you live, but you can benefit from some money off even so.